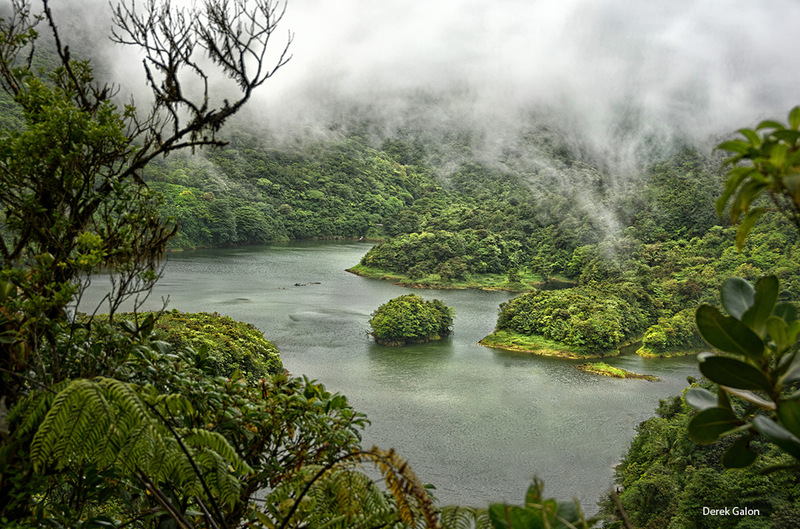 We had a nice hike last week – around the Freshwater Lake in the Morne Trois Pitons Natonal Park. 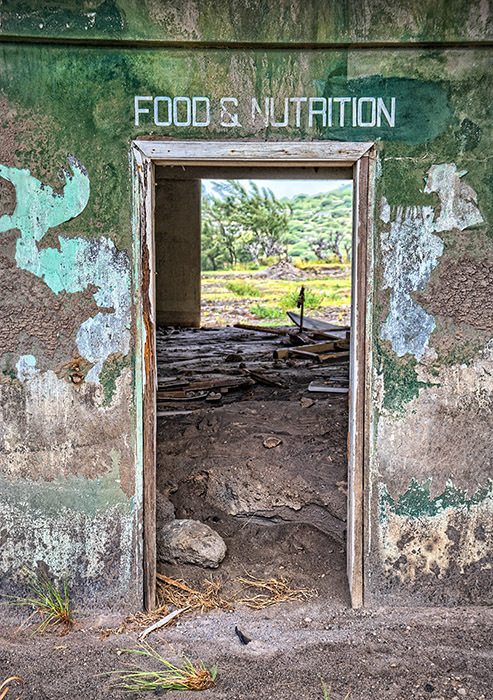 It used to be our favorite place when we were coming to Dominica as visitors, only for a short time. Now, because we live here, we have an opportunity to take our time and hike the entire loop around the lake and enjoy stunning vistas. 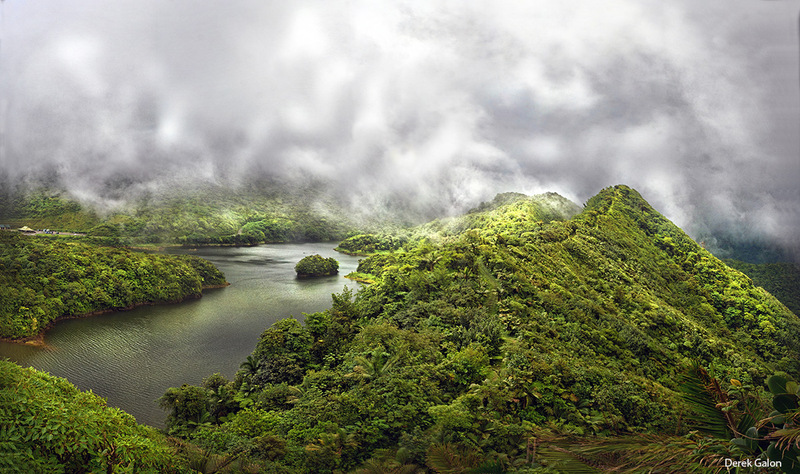 Freshwater Lake, Dominica. Sun behind fast moving clouds creates spectacle of lights. When we left the capital town of Roseau, car thermometer showed 31 C; upon arrival to parking lot, temperature dropped to 20C. We are on elevation of over 700m above sea level, high in the mountains, at the heart of the island. There’s always wind blowing clouds of mist soothing the skin after scorching heat of the city. We breathe deeply fresh air and take a first look at the lake. 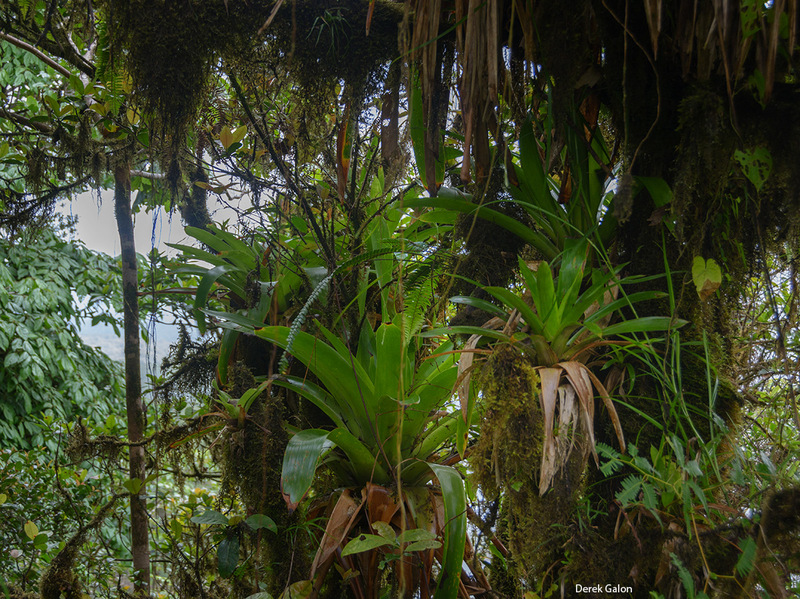 It’s situated in a valley surrounded by sharp peaks covered by montane rainforest, dense patchwork of every shade of green color. The natural beauty of the place is astounding; it is also very calm and serene. As we start to hike, thoughts and noises in our heads gradually quiet down, and we fell under charm of this magical place. Finally, we are at the top of the ridge, and views are amazing! We can see Freshwater Lake shrouded in mist and all volcanic peaks of the interior. Standing there, you can see both sides of the island (how small this island really is! ): to the west there is Caribbean sea, to the east, distant views of Rosalie Bay on the Atlantic side. The path descents and climbs up again yet to another peak with slightly different vistas, equally stunning. After the walk we feel thoroughly refreshed and amazingly light-hearted. We have to return there soon. 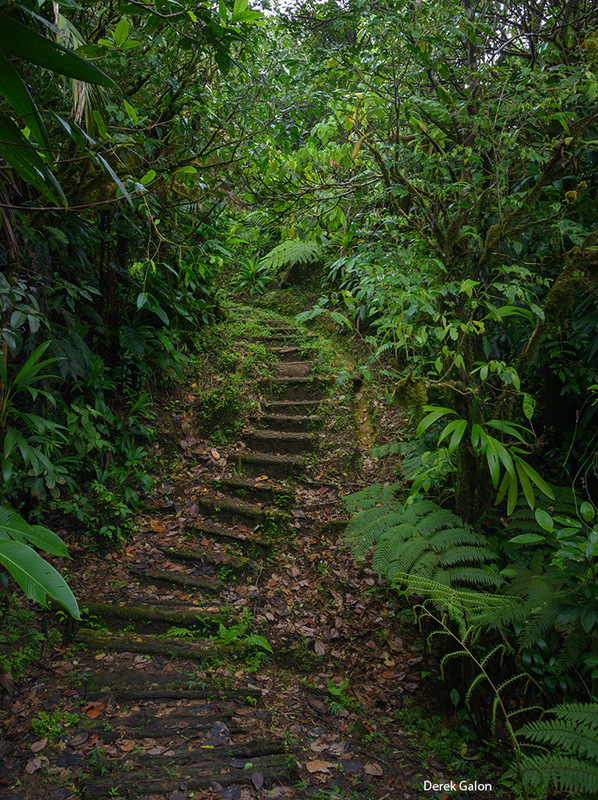 Actually, we may return indeed, as while hiking and enjoying the natural beauty of this place, our old idea of creating a coffee table book about Dominica rippened in our minds, and we just decided it is time to do it. Therefore in upcoming months we will be travelling the island scouting for most picturesque locations, photographing, interviewing people, and collecting all material for this fine task. 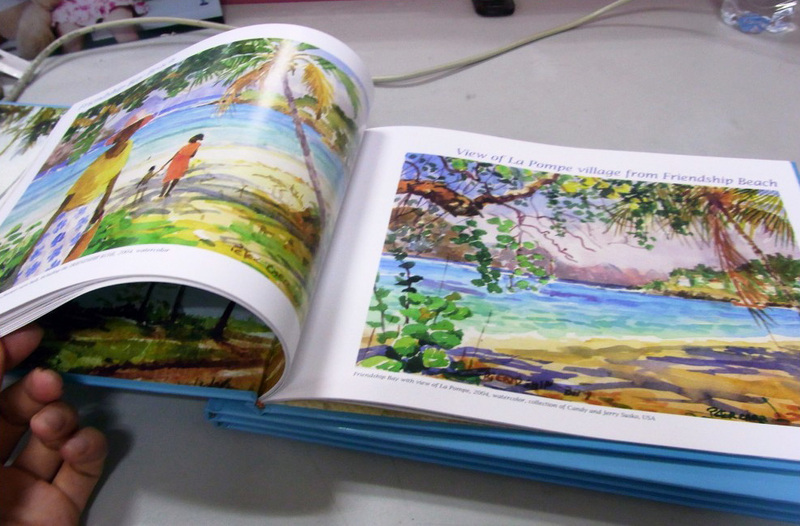 It may take up to a year to produce it, but we hope it will be as nice as our Exotic Gardens of the Eastern Caribbean, Tropical Homes of the Eastern Caribbean – or even better, as our publishing experience over last years accumulates, helping us do what we love better and better. We will keep you posted on progress of our works, therefore please subscribe to this blog, and share it with friends. All photos by Derek Galon, writing by Margaret Gajek. Please respect copyright. 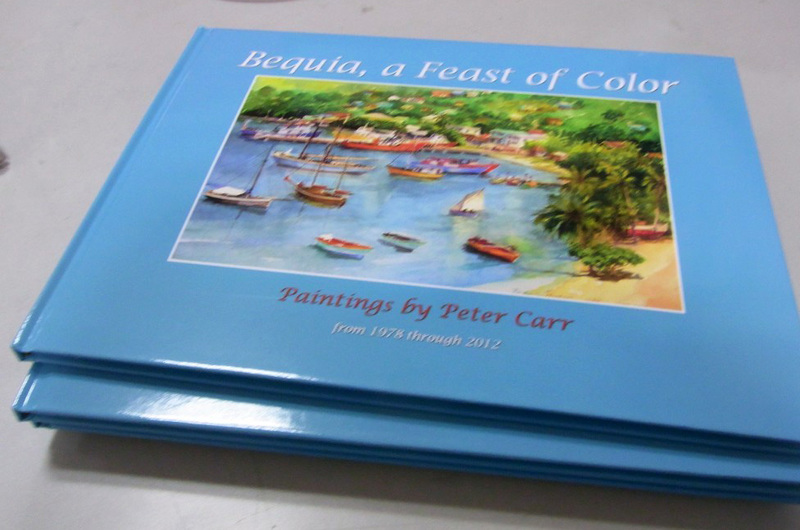 We received several messages asking when the previously mentioned book Bequia, a Feast of Colors will be ready. We had a bit of delay caused by an emergency in my family, but now all things are back in their tracks, and I am happy to say the book is already printed. It is being packed for cargo shipment, and I expect it soon will become available. You will see it available on Julie’s (author’s) site here and we also will post the news about it. It may take some extra weeks for Amazon to add it to their inventory. 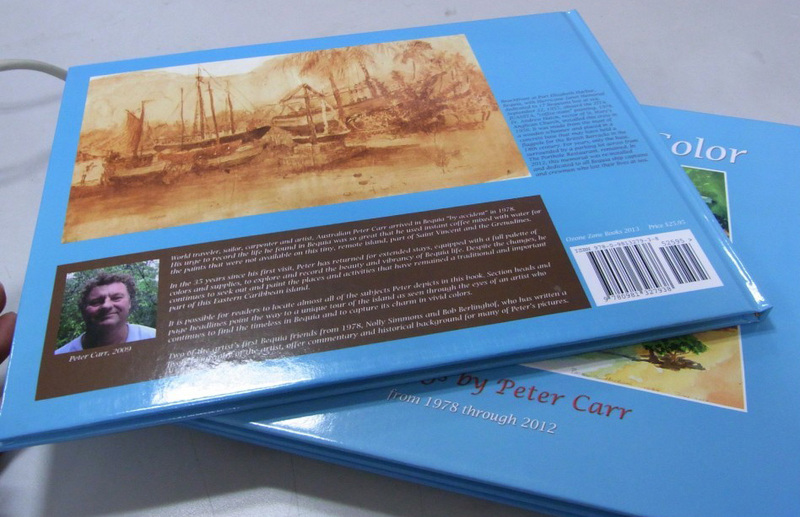 Anyway, it is ready, and I would like to share with you the very first photos of this -still smelling of print- book, I received these from our printer just today. Looks good to me! We went totally silent in last weeks, sorry. It was because of my family emergency and funeral. I personally lost my mother, and we – Ozone Zone – lost an amazing team member, experienced editor and translator. Anna was behind our multi awarded books Tropical Homes of the Eastern Caribbean, and Exotic Gardens of the Eastern Caribbean. With fine poetry and literature translated to several languages, decades of studying literature, philosophy and arts (universities in Glasgow, Oxford, and Torun), Anna became internationally respected language expert, and we were lucky to have her assistance. We will miss her on every step. Her fantastic editing skills helped our books get all these awards. She worked with us on our another book, and we hope to see that book published soon. Thank you Anna for your amazing work. And thank you, Mother, for being such fine person I will remember. Margaret plans to post a story in her memory, once we get a better grip on everyday life once again. Early morning photo from the train. Just out of Glasgow. By any measure our trip to the Isle of Skye in Scotland was absolutely fantastic! Although it was already late October, weather was summer-like. And of course people in Scotland – as always – were helpful and friendly. Not only did we take all the photographs for our client, but also did some extra sightseeing, ending up having lots of additional photos, as well as amazing memories. While the whole trip was just over one week long, it was packed with memorable moments and activities. Therefore we decided to split our post into several separate parts, in order to share our memories with you in the best possible way. 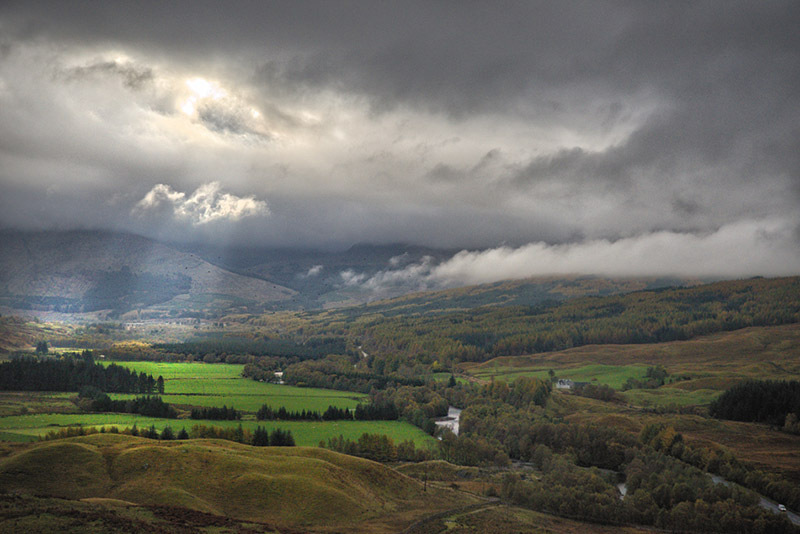 Dark clouds add drama to green hills. 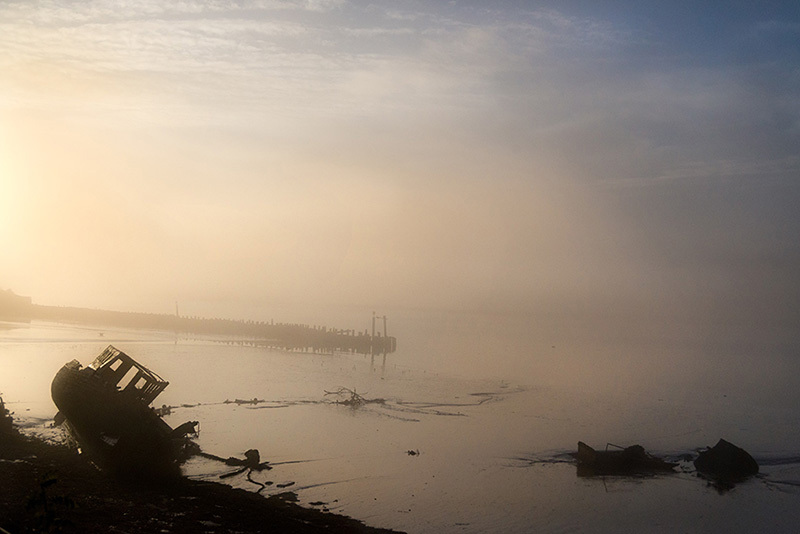 When we boarded the West Highland Train in Glasgow early in the morning, we didn’t expect such a spectacular journey ahead of us. 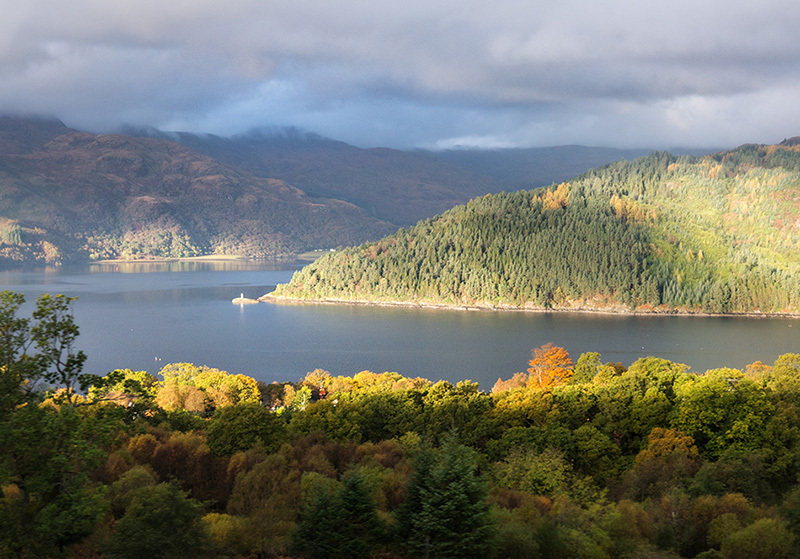 We knew that West Highland Line was voted one of the best scenic train journeys in the world, but nothing prepared us for that fantastically picturesque delight. The view from the train starts to be interesting almost immediately after leaving the station. The train runs parallel to the River Clyde along its north bank. After that the landscape opens wide. 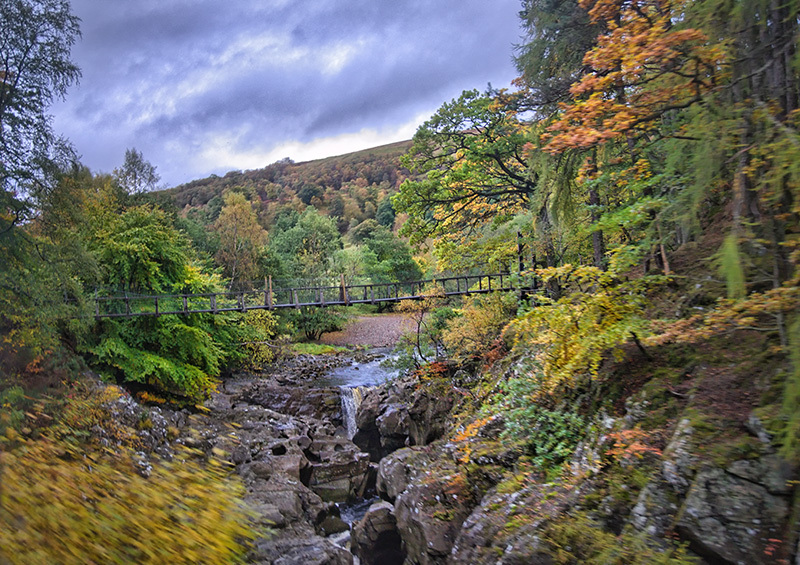 The line continues to wind its way through glens, alongside lochs, across moors, climbing up the mountains. 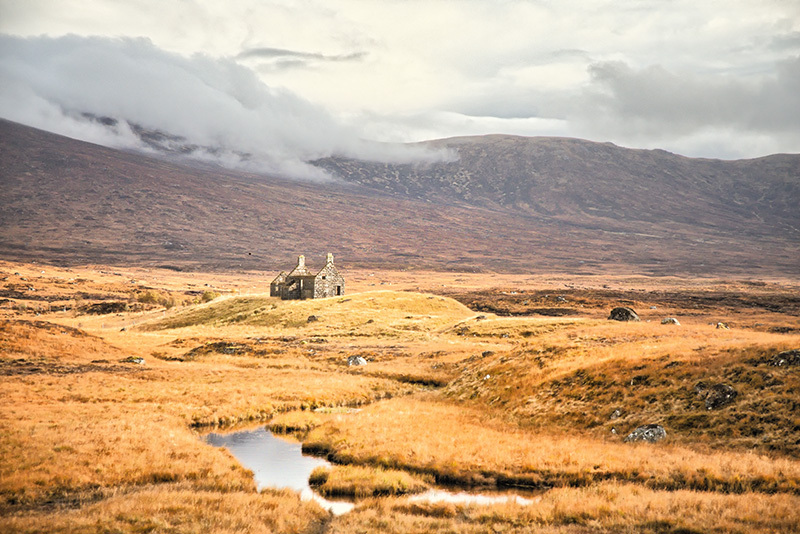 It goes through scarcely populated areas before reaching Rannoch Moor, a vast upland wilderness. Scenery changes as in a kaleidoscope. Stations’ names become more Gaelic sounding; we are now in the heart of the Highlands. Constantly on alert – I had only couple of seconds from seeing this, to taking this photo. The morning sky becomes light blue and sunny, all colours of the landscape are saturated after the rain. We are glued to the windows determined not to miss anything; one blink of an eye and the view will be lost forever. We enter “the Horse Shoe Curve”- instead of crossing the broad valley, the train makes a big, spectacular bend over the neighbouring hillsides. Next, for some people on the train comes the biggest attraction: the Glenfinnan Viaduct, the biggest bridge on the line, featured in the “Harry Potter” films. 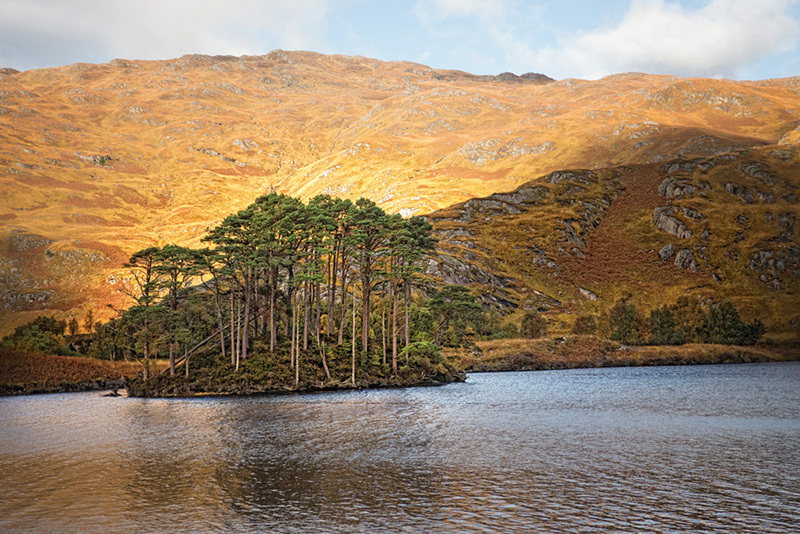 For us, the highlight of this trip comes next, past Fort William: the incredibly picturesque Loch Eilt, studded with tiny islands with towering trees. After crossing several viaducts and tunnels, we can already catch a glimpse of the sea. Our journey ends in Mallaig, a fishing port and a gateway to the north-west islands. 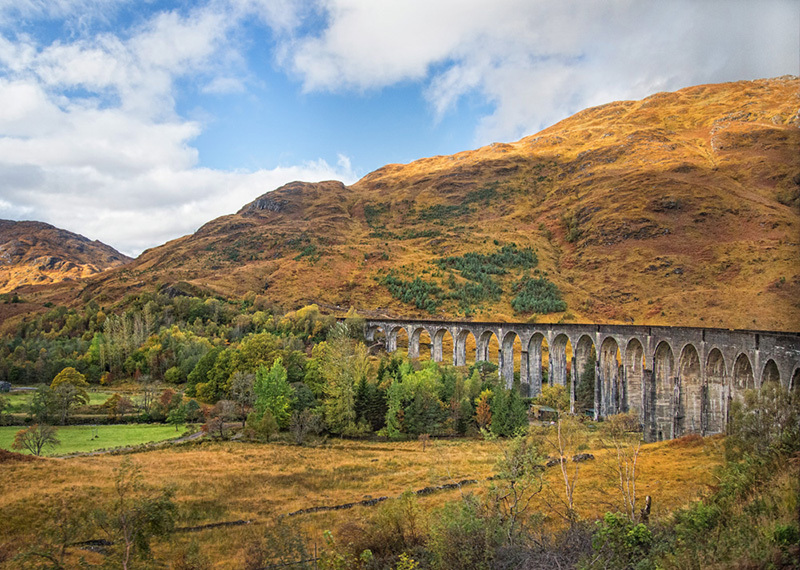 the Glenfinnan Viaduct – recognize it from Harry Potter? The whole 264 km journey takes over 5 hours, but we felt like watching an incredibly fascinating 2- hour movie. If not for the train, it would be otherwise impossible to see such a stunning variety of Scottish landscape in such a short time. 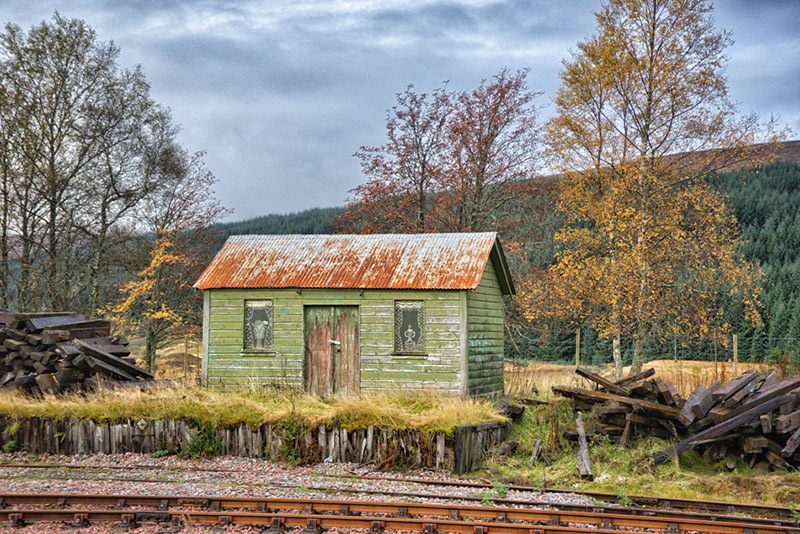 West Highland Line was built over the period of almost 40 years starting from 1863. The latest extension – from Fort William to Mallaig – was opened in April 1901. Since then, the train gives a chance to experience one of the most memorable rail journeys in the world. We plan to take a ferry from Mallaig to one of the biggest Scottish islands, the Isle of Skye. For us, the West Highland Train is only the beginning. Thank you for reading, please SHARE with friends, and if you like it – click FOLLOW to get notified when next parts are posted. Photography – Derek Galon (please respect copyright). Tile Tales looks spectacular on Metallic paper. All bright parts are almost glowing. I recently prepared several prints for a Photo Salon in Japan, and used this opportunity to work on newly purchased selection of papers from a young, dynamic company Breathing Color. Results of that work are so pleasing that I decided to share them with you ASAP. Normally I would use this kind of post in my other, more technical blog (and maybe I will repost it there too). But this story is bordering between technical, and a simple sharing of a great photo experience. 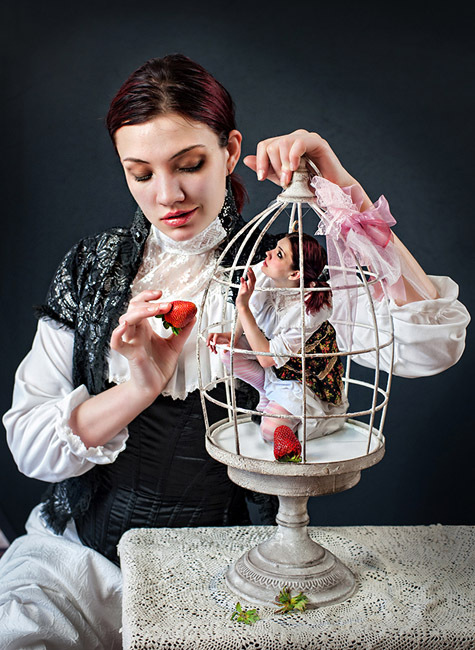 It also shows several photographs from my portfolio – therefore I decided to post it here. Preparing for THE 73rd INTERNATIONAL PHOTOGRAPHIC SALON OF JAPAN, I selected images of different styles, subjects and techniques. 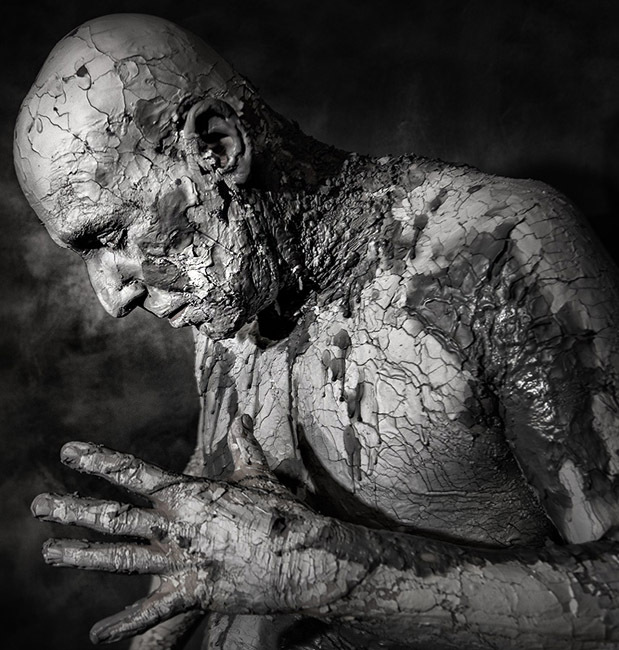 Among them, my favourite image with model Koko, called Tile Tales (which -by the way- have been just published in a limited edition book showing select fine art photography from around the world, and titled No Words, by the prestigious Scandinavian gallery 1X.). This image looks almost black and white, it is full of luminescence and contrasts. Along with Tile Tales I selected some densely colorful images, as well as couple of real black and whites. That choice made for a perfect testing ground for my newly purchased Breathing Color papers. Silvery-grey clay on No Nirvana image simply shines when printed on Metallic paper. Knowing well how the “Tile Tales” looks on traditional glossy and pearl Ilford papers, I was curious how it will look on Breathing Color’s Vibrance Metallic. This paper intrigued me instantly. It has a high gloss finish, and its surface looks a bit like mother of pearl, reflecting light in a very interesting way. So, I printed Tile Tiles – and could not believe the effect. Image got an instant “boost of light”, an extra dimension of warm luminescence. It is hard to describe. Perhaps it can be compared a bit with viewing it on a top quality monitor, where light comes from behind – rather than hitting printed image from the front. The brighter the image part is, the more of that reflective luminescence it gets – effectively expanding gamut and dynamics well over typical limits. The image received its own life! If you would have two Tile Tales prints – one on a lovely Ilford’s Pearl paper, and another on this Metallic – I bet you would pick first the metallic one, even without thinking why you did so. It definitely is a paper which will help your images being noticed. Even in a poor light it still has quite a lot of appeal. I found it fantastic for images which strongly accent their bright spots, and with bright colours including grey/silver/white. Therefore I couldn’t resist printing my new image No Nirvana (with Michael Ward – model) on it – and bingo! Again, the image was stunning. Light grey elements of clay look just AMAZING. Unbelievable print! I printed on this paper both with dye and Epson pigment inks – and it looks same spectacular with both. 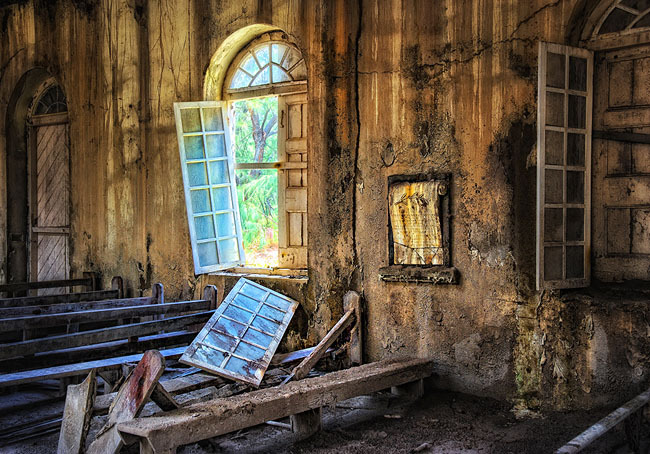 “Abandoned by God” photo from Montserrat gets a new life on Metallic paper – all bright parts including grey volcanic ash are simply stunning. Next, I printed Rain Dance (with Daniel Corbett – model) – image with vibrant colours and lots of dark elements. For this one – I picked luxurious, lush mat paper called Vellum Fine Art Paper (again by Breathing Color). Wow! Rarely I see such elegant and deep palette as this. A beautiful gallery quality print. Thick and heavy, it is really impressive. I quickly varnished it with a matte spray to protect against fingerprints, as this image just asks to be touched. Rain Dance looks rich and elegant on Vellum paper. I used the same paper for my black and white image called Always Fresh flowers (with Eden Celeste – model). Again – amazing result: deep blacks look on this paper almost like on an opulent velvet fabric, you almost see a depth to it. A remarkable paper, and instantly on my favourites list. I also tested a semi-gloss kind of paper, called Vibrance Rag, printing Revisiting Dr. Freud (with Rowen Bellamy – model). At first, I was taken aback by its look. It has a slight texture and a light glaze, which did not look to me very appealing straight from the box. It looked too “artificial”, I thought. But when I printed on it a photo full of colour, textures and contrast – this paper got life on its own. Covered with ink, gone was that “artificial” look, and it looks like a really fine gallery grade print. Thumbs up again! Vellum Fine Art paper makes “Always Fresh Flowers” look almost three-dimensional. Fantastic art paper indeed. I still have some other Breathing Color papers and supplies to test – but these first three got my highest approval, and I can say that with their price being significantly lower than other top brands (Epson or Canson for example) – they will be often used for my exhibition quality works. They exceeded my expectation – and those of you who know how picky I am – should realize it is not often happening. Like with all photo papers, you should consider specific images and select paper which will work well to accentuate your photograph. But you will find that Breathing Color can offer you really fine papers for many situations when you need the best prints. And the great news is – they offer low priced sampler packs! This is what I just used. Revisiting Dr. Freud on Vibrance Rag looks very classy and rich. I hope you enjoy this post, and if you do – please SHARE it with friends. Thank you, until next time – perhaps right after our return from Skye, Scotland, later this month. All images copyright Derek Galon and Ozone Zone Books. Please respect it. 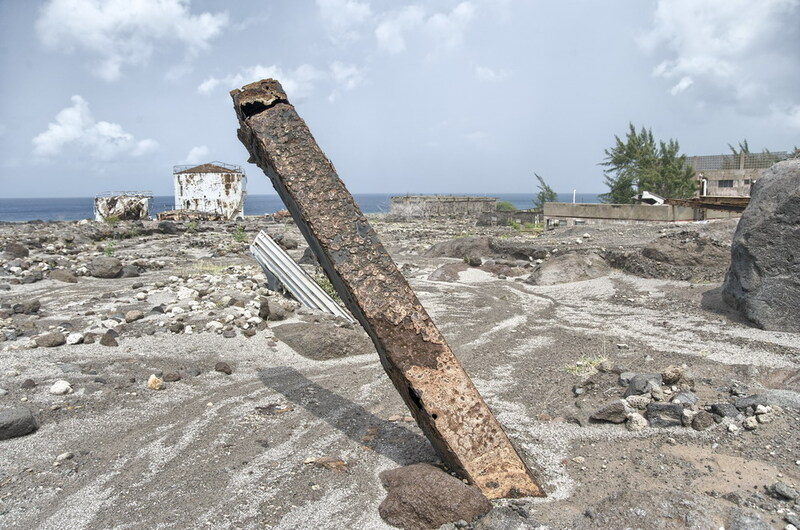 Some days ago we posted our memories from visiting city destroyed by volcano – Plymouth, in Montserrat. You can see link to that post on the right side, along with link to the story about our whole Montserrat trip. 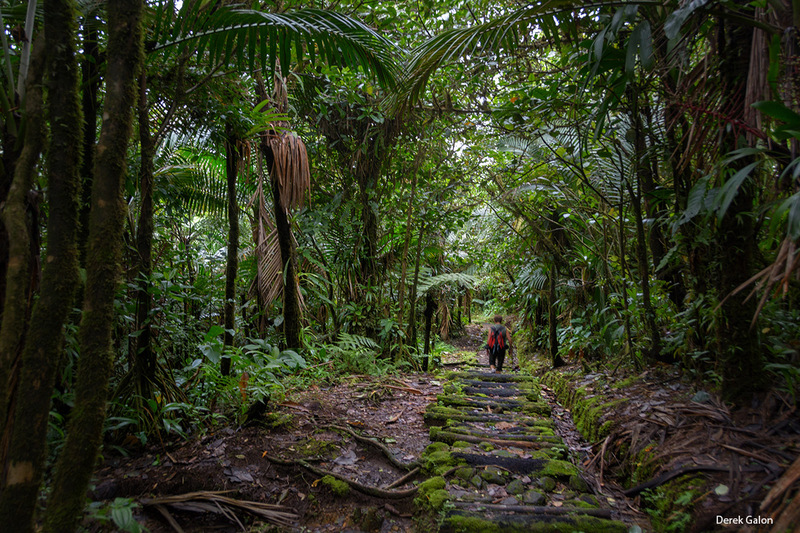 Our guide finally arrives and we follow his jeep, driving through a verdant landscape towards the sea. After passing the last inhabited houses – beautiful villas shaded by scarlet blooming flamboyant trees – we arrive at the check point manned by a volunteer – a retired policeman. Since we have special permit, we are allowed to pass further – past the gate to the exclusion zone. Our guide tells us rather harshly that we have maximum two hours’ time to explore, need to keep eye and voice contact, and “you have to leave immediately when I tell you to.” I notice his hands are shaking when he opens the gate padlock. I wonder – is it because he is aware of an impending danger of which we are blissfully ignorant? Finally, we reach the site of what once was Plymouth, the capital city of the island, to begin our exploration. We leave our jeep’s motor running. I step outside to take a deeper breath. There is another photographer with us, that French journalist. I can see him running in my direction. “What did you see?” I ask. 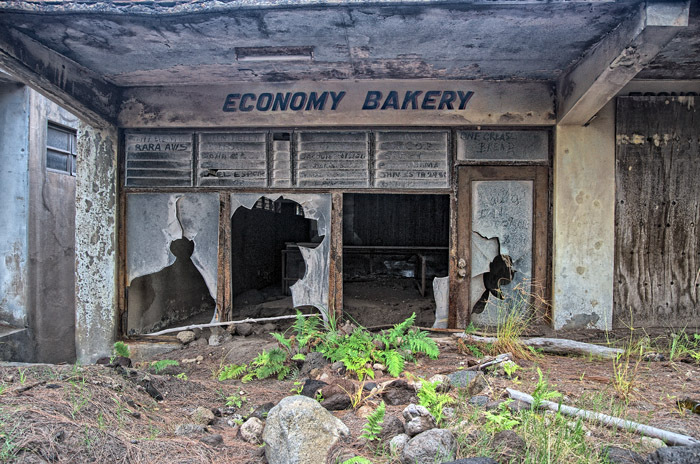 “A bar that looks like people just left, leaving broken glasses and newspapers on the floor.” He and Derek move quickly from building to building trying to capture photographs of as many sights as possible. Another building of interest – elementary school. 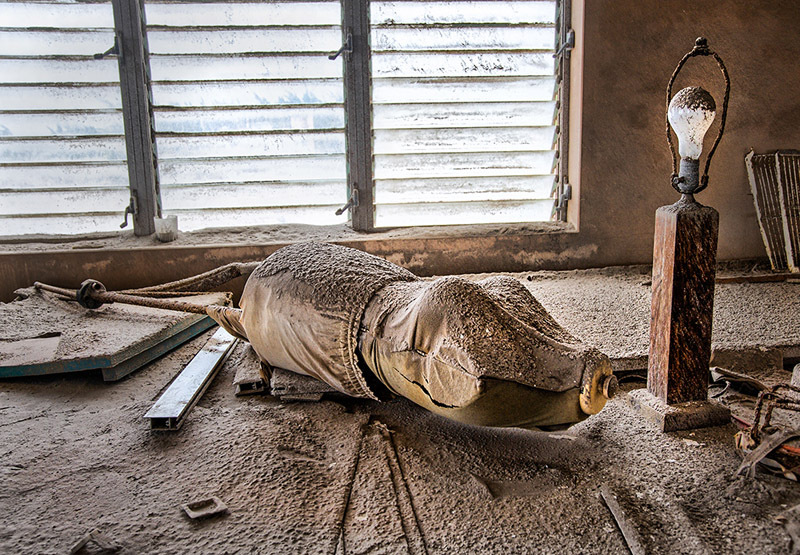 Rooms are filled with mud and ash to half their height. A chalkboard full of scribbles, and table almost completely drowned in ash add to the eerie feel of the whole place. Our guide nervously calls his office to confirm volcano conditions still permit to continue our stay. 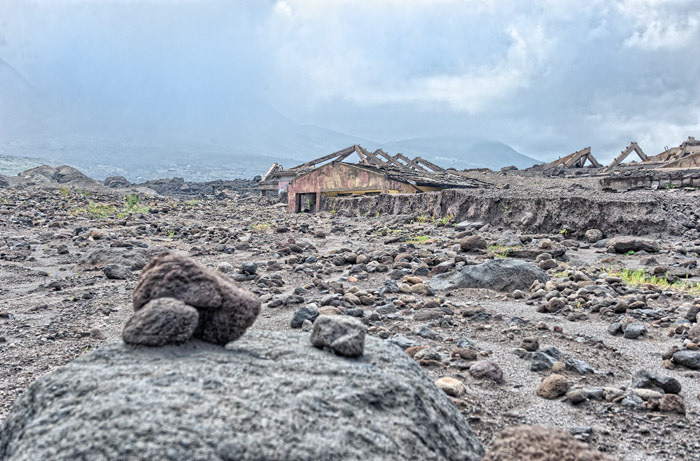 “If the volcano decides to emit pyroclastic flows now, what are our chances of survival?” I ask our guide. “We have only 2 minutes until it reaches where we stand. It’s not enough time to escape,” he answers quickly. It’s not just the spewed hot rocks and ash that pose the danger: the hot steam and pressure accompanying them are equally destructive. It’s easy to believe that, since all the time we walk there, we’re surrounded by pungent sulphur fumes. “If anyone feels sick because of sulphur gas, we need to get immediately out,” cautions our guide. 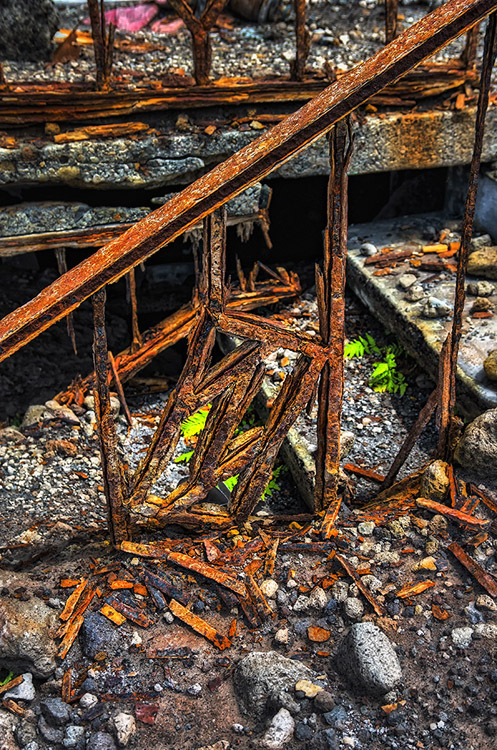 There is no colour here, except for corroded iron structures covered by reddish rust in a vast sea of grey ash. There is an overwhelming silence: no bird songs or sound of leaves rustling in the wind. It’s like a desert – no, in comparison the desert is full of life! I find myself in front of a bakery – so the signboard reads. Glimpsing inside through the shattered windows, I’m suddenly aware of a sound of flipping paper pages at my feet. I bend down to see it closer. It’s a Montserrat passport of some widely travelled lady. Was it lost in the haste of evacuation, dropped out of an open handbag? What happened to its owner? I wonder. Our last place to see is a church on the outskirts of town. We walk over an iron gate, almost totally buried in ash. The church is surprisingly bright inside; rays of light enter through a broken roof illuminating the nave. I notice pages of a music score – Handel’s Messiah lying on the floor. 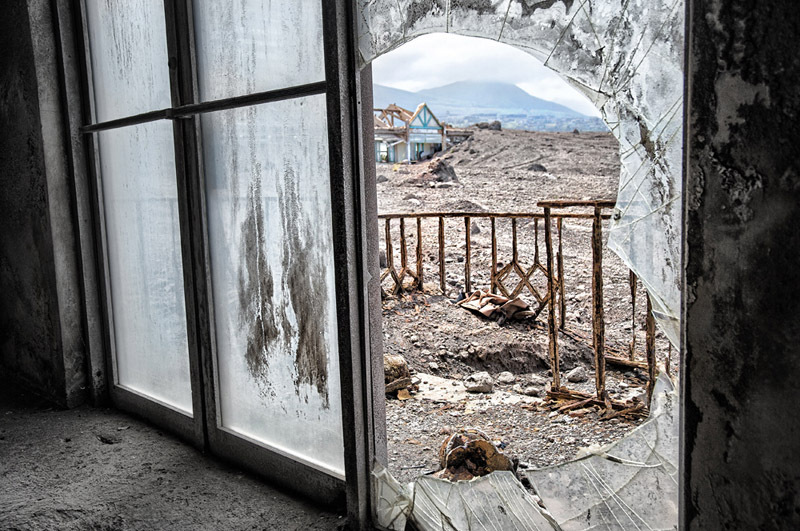 As I’m leaving the church, I think about all the people who lived in this destroyed city – close to four thousand residents, whose lives were changed forever after the eruption. Our guide is visibly relieved when we are leaving the site. After just 5 minutes’ drive we can again hear birds singing. Photographs copyright Derek Galon, Ozone Zone. As we both are deeply moved by the visit to Plymouth, Derek created three commemorative limited edition posters showing selection of his best photographs from there. You can see them at Gallery Vibrante, which offers Derek’s art photography for sale. Also there you can see his other best images from Plymouth (in Architecture and Travel categories). Thank you for your visit. As always – if you like it, SHARE it with freiends, please. Click follow to receive new posts by email. We were told sometimes slide show does not work correctly. If you experience this problem, please use this link to view all photos on Picasa. When we arrived at the entrance to Abkhazi Garden, we both stopped for a moment as if afraid to open the gate. 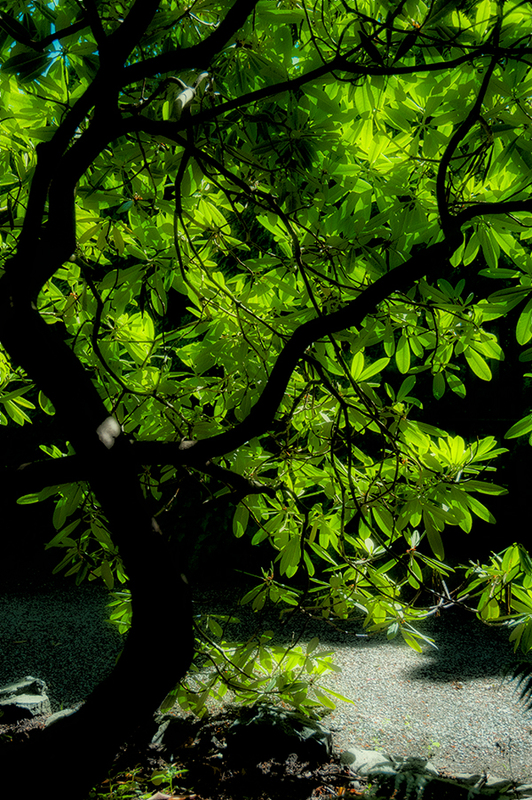 The reason for our hesitation was clear enough for us: we wondered – is this garden still as beautiful as we remembered? Or perhaps it is now totally changed, or has fallen into neglect? We had visited Abkhazi garden several times after it was saved from the developers. 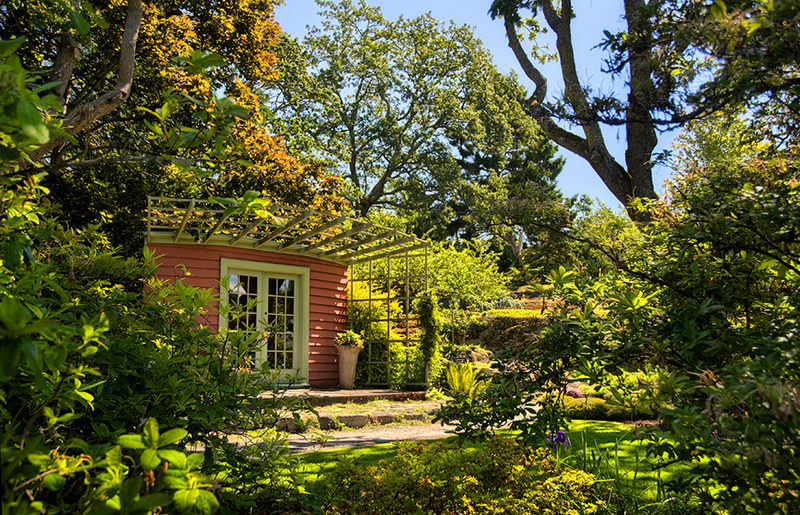 Our humble donation was only a tiny drop in an immensely successful and quite heroic public fund-raising campaign in 2000, which led to the acquisition of the garden by The Land Conservancy. Unique benches look like they always been there as an important part of this garden. Slowly, we stepped into the garden leaving the city street behind us. We found ourselves in a woodland, under towering old rhododendrons and native Garry Oaks underplanted with lush ferns and hostas. As we were slowly walking a winding path through the garden, all our fears completely disappeared. 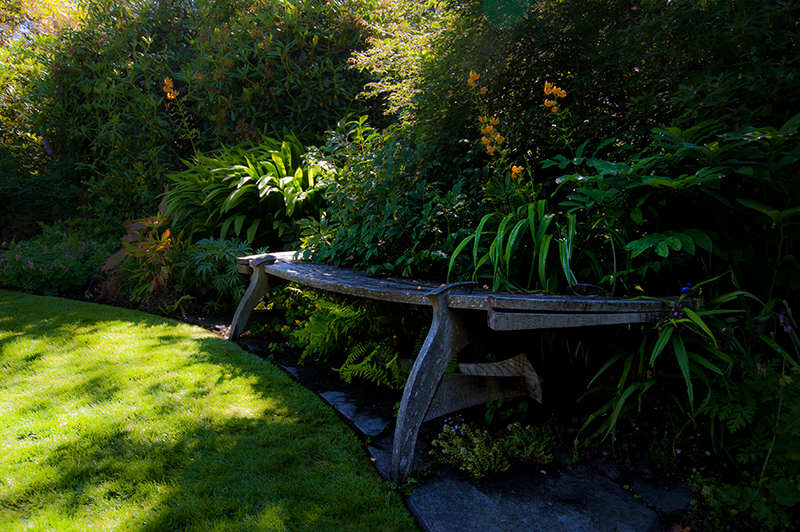 We noticed how splendid the garden looks, cared for not only with expertise and knowledge but also with love. Beautifully created, this spot brings to mind large vase full of freshly cut flowers. Love and passion are ever-present here, making it quite a magical place. 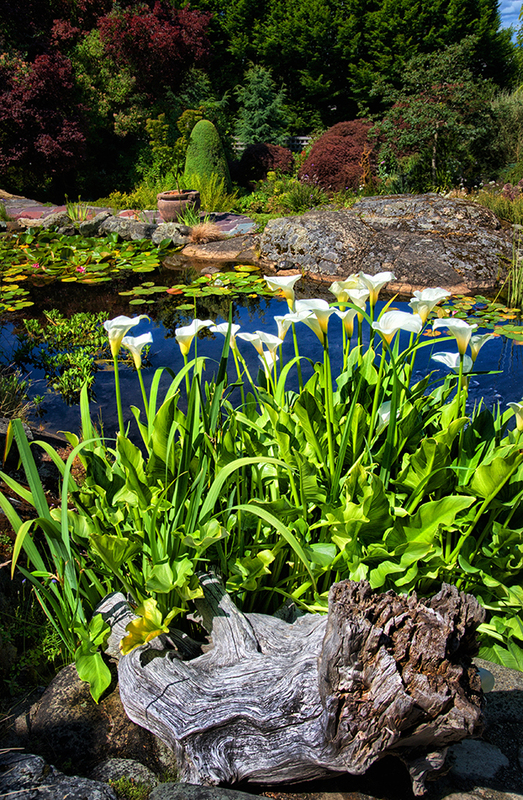 It is “the garden that love built,” love between its creators: Peggy and Nickolas Abkhazi who shared the same passion for their new piece of paradise, a safe haven in their rather dramatic lives. After their death, it seems like that love was carried on by all the people whose hard work and dedication enable the garden to flourish. 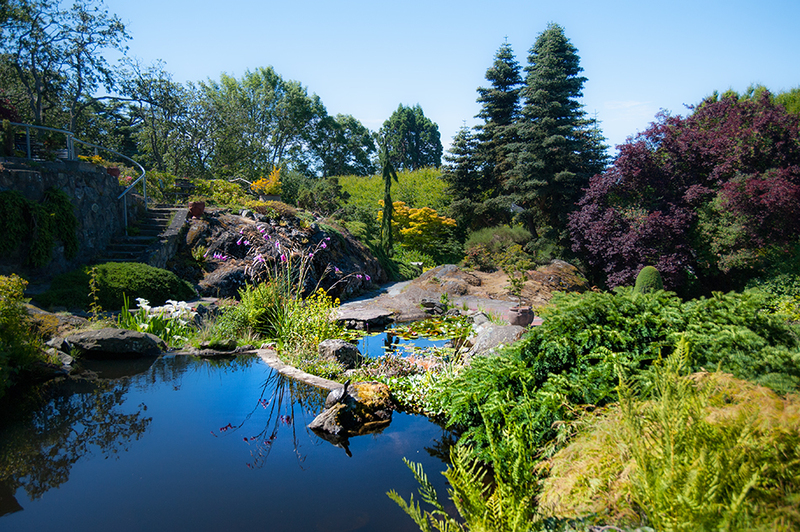 One of the first were Christopher and Pamela Ball who continued to keep up this world-class garden for the next 10 years. 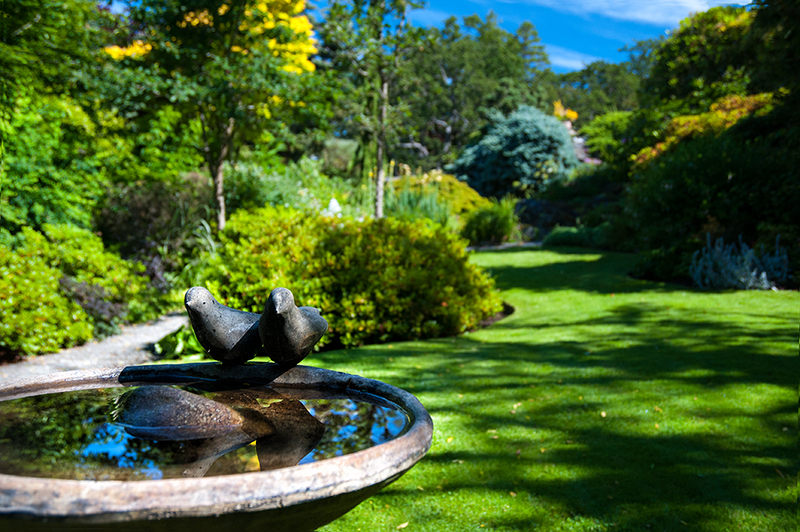 Fine bird bath at the first wide vista near entrance instantly adds to happy feel of the place. 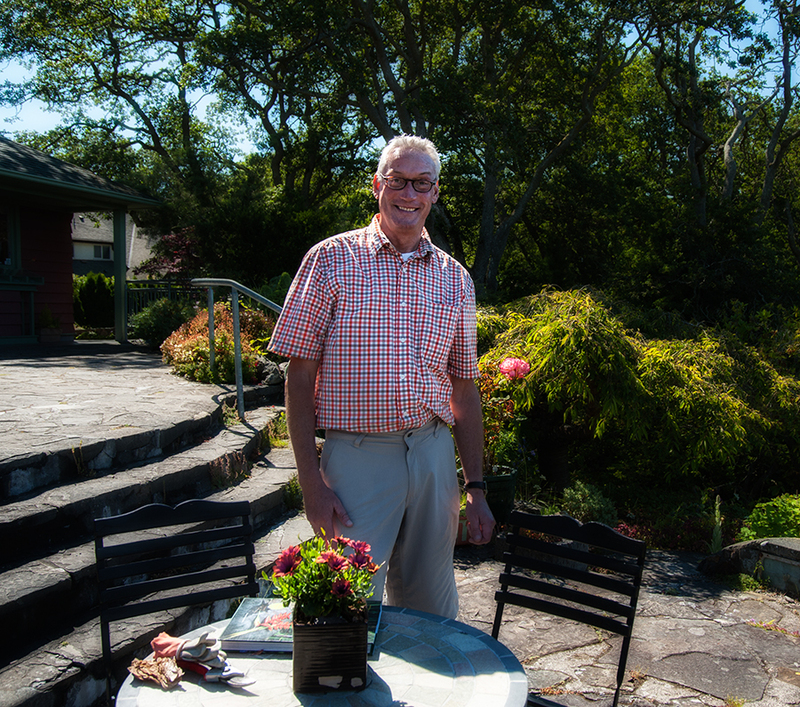 When the land was submitted for rezoning, Cyril Hume, a garden historian led the fund-raising campaign and the garden restoration. All the head gardeners who came after him shared the same passion and devotion to the project. Today, the garden is in the capable hands of Jeff de Jong and a group of impressively skillful volunteers. As a result, Abkhazi Garden is resplendently beautiful. 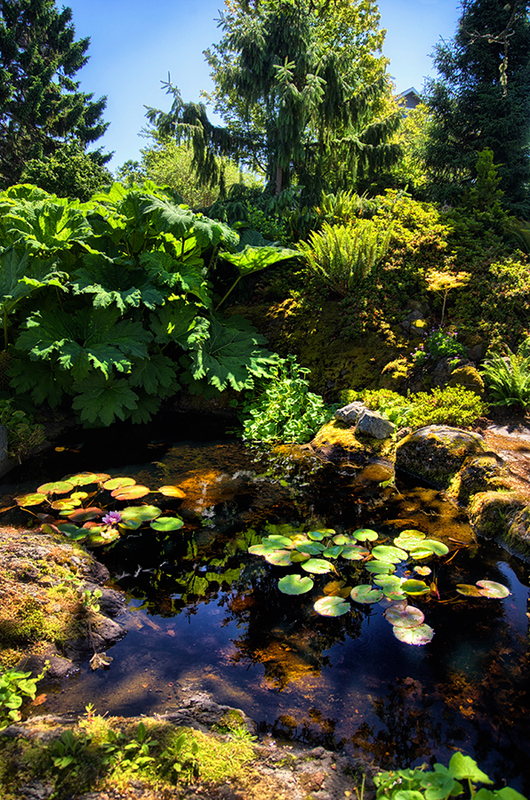 Ponds look like colorful jewels mounted in greenery of the garden. We finished our garden tour inside Abkhazi house, built by John Wade in the style of simple modernism. Broad glass windows offer spectacular views of the Olympic Mountains, while connecting the interior to the exterior spaces. 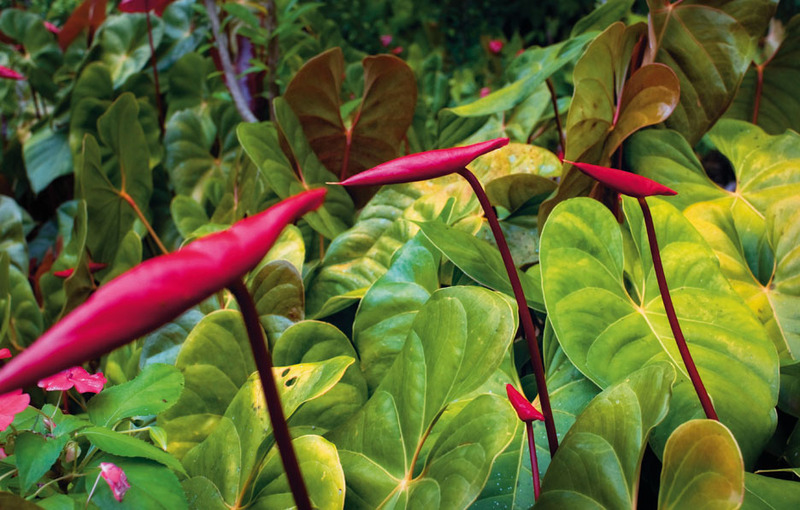 Perhaps the most striking feature of the house is that organic flow with the surrounding landscape, perfected in architectural designs of the tropics. While working on our book ”Tropical Homes of the Eastern Caribbean”, we were often fascinated by architects who mastered this skill of seamless integration of outside and inside spaces, like Oliver Messel, or Lane Pettigrew. Standing on a stone-paved patio, we marvelled at the brilliant layout of the garden complementing the natural landscape. Thank you for stopping by. If you like this post – please click SHARE button or other media button you use. 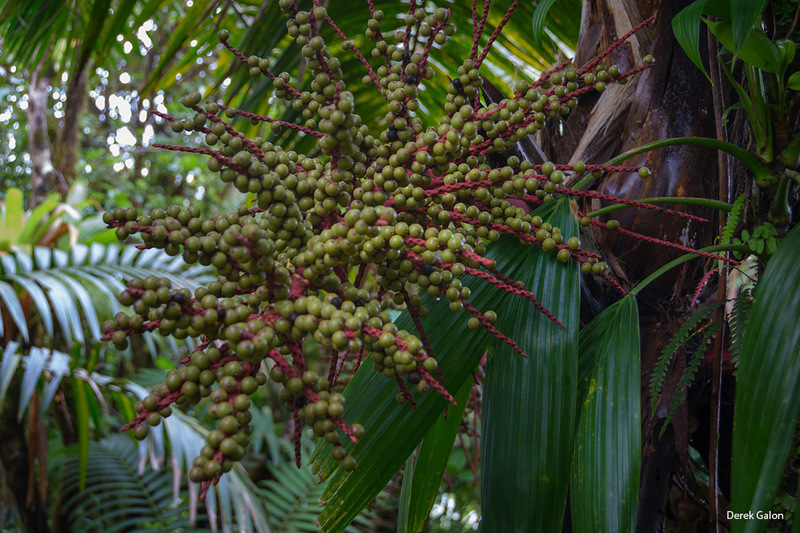 allow me to present here another little treat – one more photo from our upcoming book Exotic Gardens of the Eastern Caribbean. This time it is a photo showing fields of Anturium at Montreal Gardens in St Vincent. This garden is amazing, and huge fields of various types of Anturium are simply mind-blowing. Red, pink, white, cream… almost overwhelming experience. I hope you will enjoy this pic as much as we do! Looks like soon we are going for next photo trip – this time to St Lucia, Dominica, Martinique, Grenada, Barbados, Jamaica and Honduras. It will be six weeks of location work. Surely, I will post some of photos made there. Stay tuned – I will post more before our departure. Cheerrs, and Happy Valentine Day!